Let’s face it, suicide is a touchy subject most don’t want to talk about, let alone write about. In 2012, when I began putting together the first draft of the Station Series, I wasn’t thinking about all the negative stigma the subject matter endures, instead I was thinking about how to give my characters a second chance after making the heartbreaking choice to take their own life. And I wrote the book with my Aunt Teresa in mind, who took her life a short time before I began writing my first book. She was an amazing person with a huge personality and even huger laugh. She was my biggest cheerleader in life, helping me through some tough personal times. I guess in a way, I wrote the book for her so that I could imagine her “spirit” or “energy” moving on and never dying out. I’ve waded through enough of Abby’s memories to understand why she almost threw herself off the top of a tree. The next few days would be critical, so I crack my imaginary knuckles and stretch my imaginary neck, and roll my imaginary sleeves up to prepare myself for this tough case. Abby is going to need all of the training I’ve had and probably more, to successfully pull her back from the edge she seems ready to launch herself from. It’s not going to happen on MY shift, kiddo. We’ll find a way out of the dark, don’t you worry. I have big hopes for you…but for now…baby steps. When’s the last time you’ve had a candy bar? For girls, chocolate fixes almost everything. But the story isn’t about fixing a suicidal person’s world with sweets. I think this is something perhaps a few readers may not understand. It’s about redirecting and offering up alternatives and trying to help those in need by showing them they are worth living. And doing all that with a little humor and things that most YA’s will relate to. 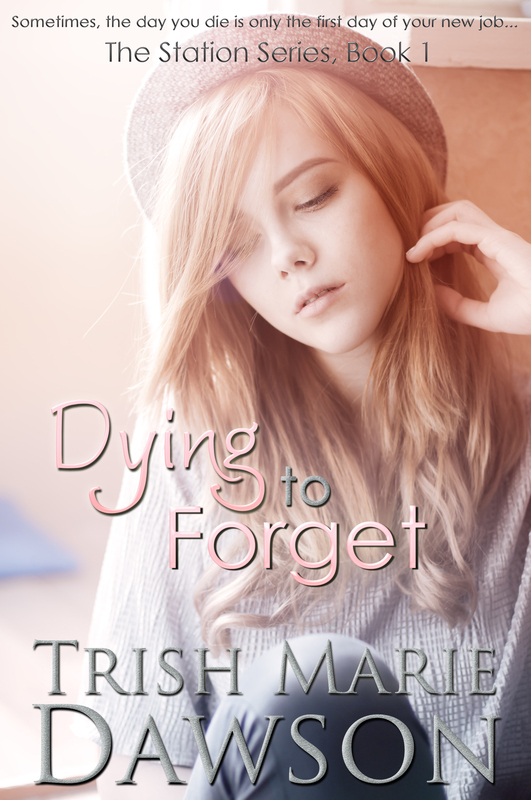 When I first published Dying to Forget, I had no idea what would come out of it. I thought it was a creative peek into a fictional afterlife. I didn’t know it was going to touch some in a rather powerful way. Without going into details, I’ve received several messages from readers who thanked me for publishing this series. People, just like you and me, who happened to stumble upon my little series at a down time in their life, and then wrote me via my author page or email to say my words helped keep them from cutting themselves, or actually taking their lives, or that this book helped them get over the loss of a family member who committed suicide. To say I was blown away is a gross understatement. Some of these people I’ve stayed in contact with and become friends with online. And I love them all. Because I’ve been there. I know what it’s like to lose a loved one to suicide. The guilt and sadness that follows. I know what it’s like to feel down and unreachable and as if the world just doesn’t need me. But you know what, I’m still here. And you are still here. And that’s the way it should be. This week’s Throwback Thursday is an homage to all those impacted in whatever way by self-harm, suicide or the loss of a loved one. I hope that if you do read Dying to Forget, or any of the Station books, that you’ll take with you one thing: hope. You can find DYING to FORGET for free on Amazon, Nook and Smashwords. I hope you enjoy the story and take something positive away with you. Happy Reading, Everyone! Be kind to yourself and your loved ones. I didn’t have any problems with the story at all. It was a good read. Lovely post about writing what you feel needs to be written rather than caving to what reviewers say. I get the feeling writers that some just write what they think will be popular, rather than what they actually love, and that’s sad.